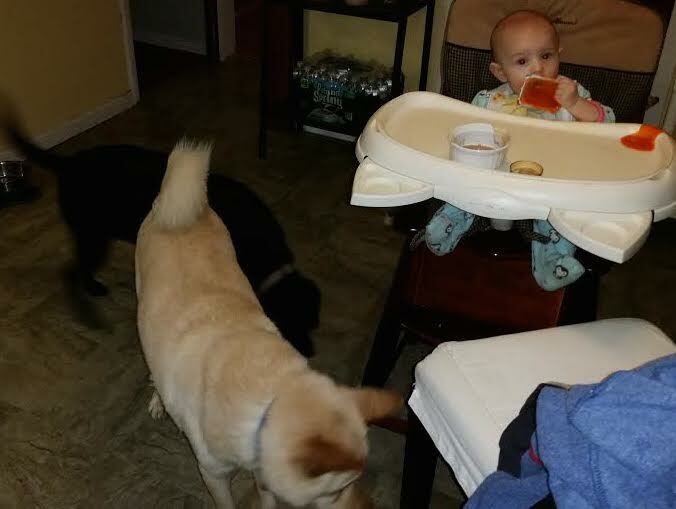 Ever since we started feeding Genevieve chicken, our dogs have been circling her highchair like sharks. Her daddy is away on business, so I wanted to capture this moment for him last night. Baby G was in her highchair, with chicken and carrots in front of her. The dogs were next to her. Lulu, our plott hound (aka “pig hound,” because she eats everything!) actually jumped up on her highchair at one point, so that’s something we need to work on! Sharks and baby. Mess in progress. I’m taking a picture with my cell phone. Genevieive decides to grab the carrots and fling the container backwards, leaving a mess all over her high chair and on the floor. As I run to get paper towels, Lulu jumps on the counter trying to eat the open chicken jar. When I got back to G, I hoped the dogs would lick up the carrots so I’d get a head start on cleaning the floor, but that didn’t happen. The lessons I learned: No pictures during feeding time. No dogs in the kitchen when we’re feeding G chicken. we have those pj’s!! does she feed herself already? !